The state has awarded $500,000 for recreation projects in Franklin and Cumberland counties in Pennsylvania, one of which will be an iPhone application to promote the Lincoln Highway Heritage Corridor. According to the Chambersburg Public Opinion, “the Department of Conservation and Natural Resources invested $23 million in 189 conservation and recreation projects in 65 counties. Another 177 applications were not funded. 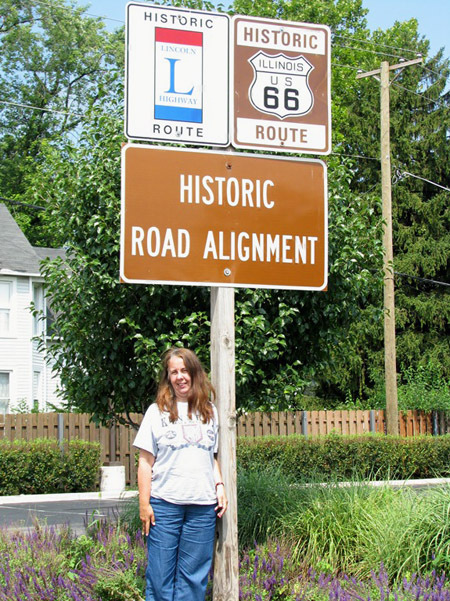 A grant of $180,000 will be used to develop an iPhone application to promote tourism in the Lincoln Highway Heritage Corridor and to finance a variety of other Lincoln Highway programs — mini-grants, school programs and repair interpretive exhibits and signs. 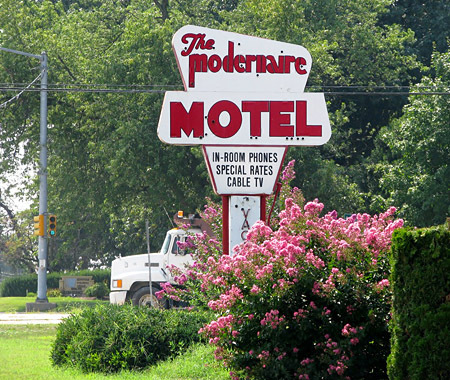 The state’s National Road Heritage Corridor is also developing an iPhone application. Effie Gladding had just returned from three years touring the world when she departed San Francisco on April 21, 1914. She and her husband Thomas first drove the El Camino Real 600 miles south before turning and meeting the Lincoln at Stockton. In a 262-page book she titled Across the Continent by the Lincoln Highway, she doesn’t reach the focus of her title till page 108, then detours off it for another 47 pages near the end, skipping most of Ohio and Pennsylvania. 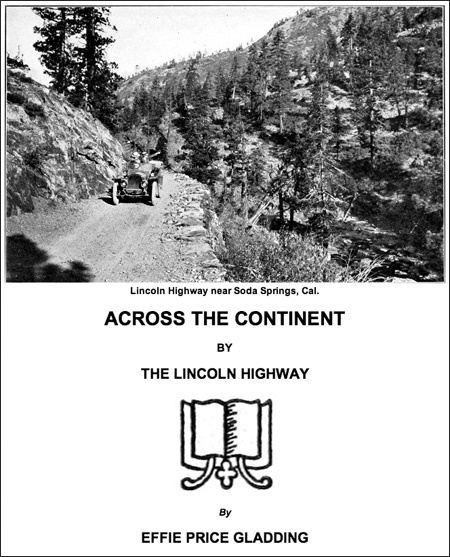 But it was the first full-size hardback to discuss transcontinental travel, as well as the first to mention the Lincoln Highway. Click the link above or go to Project Gutenberg’s main page for the book for other ways to download the text and images. 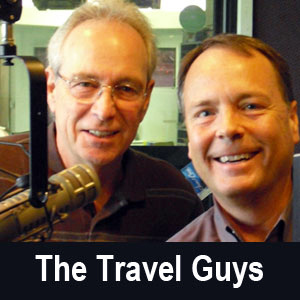 The Travel Guys radio show out of Sacramento featured a special Fourth of July episode along the Lincoln Highway. One of the guys is radio personality Tom Romano, while Mark Hoffmann operates Sports Leisure Vacations, which offers tours of 2-lane roads like Route 66 and now the Lincoln Highway. 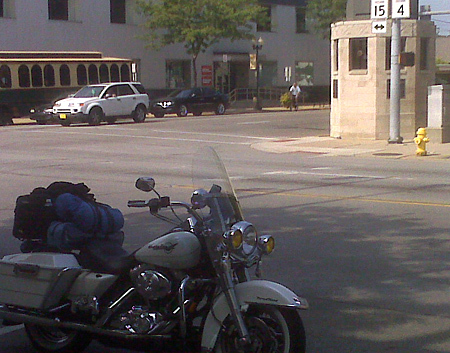 Your blog host, me, Brian Butko chimes in with a few favorite stops along the Lincoln. Listen HERE. You can also download archived mp3s here. At the LHA conference I had the pleasure of meeting John and Joyce Jackson of Delaware, Ohio, who were following the Lincoln Highway westward using my LH Companion guidebook! What’s more impressive is they are stopping at every place mentioned AND getting signatures when they could!! Turns out they too have a blog that’s a fun-to-read adventure at blog.jacksonlhtour.com/. 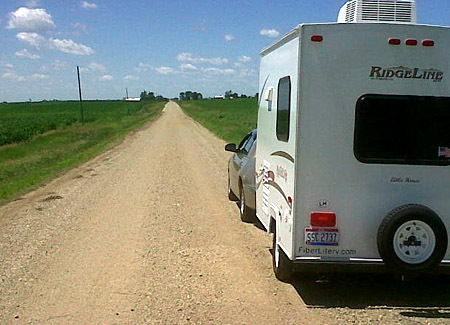 After driving from NYC to Indiana last year, they’ve added a 12-foot Ridgeline travel trailer to hitch to their Lincoln Town Car for 2010 as they head to the Pacific. Here they are on gravel Lincoln Highway between Ogden and Beaver, Iowa. 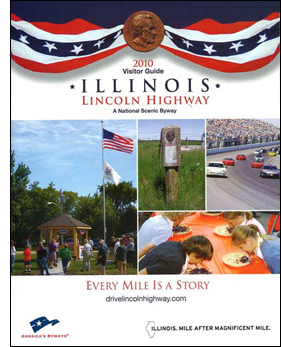 The 2010 Illinois Lincoln Highway Visitor Guide from the Illinois Lincoln Highway Coalition is now available around the state or by mail. New features include a page about the completed interpretive gazebo project, a half page for the current interpretive mural project, and an easier-to-use map of the highway with icons for gazebos, murals and exhibits. Another change moved accommodation listings from each community to their own section. Fill out the form here to get yours: www.drivelincolnhighway.com/visitorsguide.html or view and download a complete copy at www.drivelincolnhighway.com/LH2010guide.pdf/. 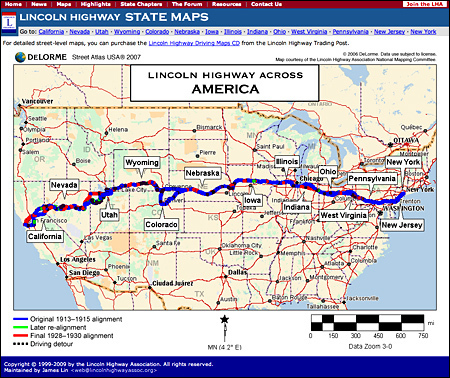 Paul Gilger, head of the mapping committee for the Lincoln Highway Association, has uploaded a national and statewide maps of the Lincoln Highway to the LHA site. Though they only show basic routings, the maps should be a huge benefit to fans thinking of following the first coast-to-coast highway. Once you get to the United States map, you click on the individual states to go to that state map. (There is also a place to click at the top of the page to get to the states.) Once on the state maps, you can click and go from state to state. As you can see, at this scale, these maps can only be very generic, and can only show the general layout of the Lincoln Highway. Included are the county names, the names of major cities, and the route signs for the major highways that follow the Lincoln. 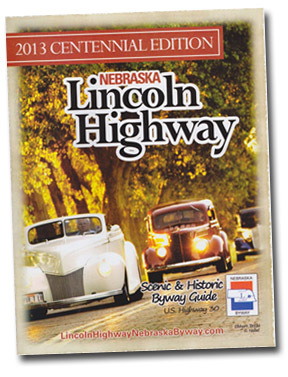 To see the exact location of all the alignments, it is still necessary to purchase the Lincoln Highway Driving Maps CD. It has taken 2 years to format these maps, and then another year to set up the map pages. A very big thank you goes to our webmaster Jimmy Lin who worked hand-in-hand with me. I provided the map artwork, and then Jimmy set up the pages and their various cross-links. He also provided many graphic refinements to the maps. You’ll find the maps at www.lincolnhighwayassoc.org/maps/. To purchase the Driving Maps CD, visit the Lincoln Highway Trading Post.